The simple but powerful translator workbench is designed to help translators work efficiently on various kinds of content. To ensure the workbench runs smoothly on your computer, you should use the latest version of Google Chrome, Firefox or Safari. Orders are submitted by customers and contain Jobs—individual blocks of text (files are handled outside of the workbench). Jobs are grouped into Collections based on customer preferences. You, as a translator, will pick up and work on Collections (a Collection may contain just one Job, or many Jobs). 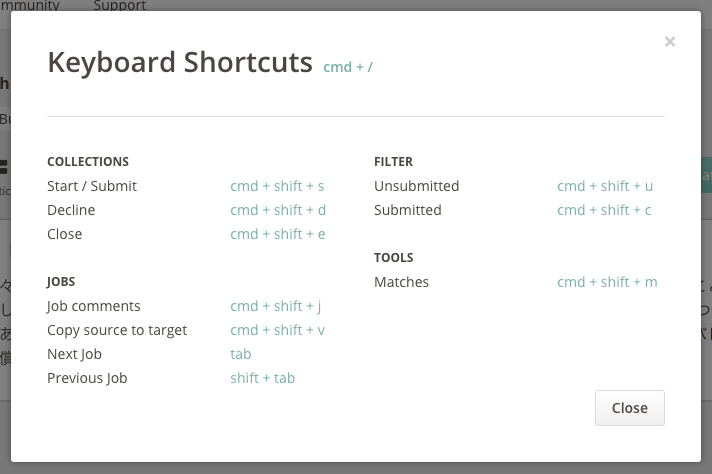 Switch between horizontal and vertical layouts, depending on your preference. The list of Jobs can be filtered according to their states (All, Empty, Unsubmitted, Submitted, Revising, Cautions and Errors). Normally you should focus on "empty" or "unsubmitted" Jobs. You can select “All” to unfilter. If you are working on a Collection that contains too many Jobs (hundreds or thousands), the workbench may get slower as you progress and load more and more Jobs. To avoid from overloading the workbench, we recommend you to complete Jobs in batches (e.g. 50 Jobs). Then, use the filter to view only "empty" jobs. This will hide all "unsubmitted" jobs, helping you keep a healthy speed in the workbench. Within a Collection, a Job can be identified as a block of text inside a white square box. Each Job inside a Collection has an individual Job ID. You can view it by placing your mouse over the "🛈" icon on the top left of the Job box. If you need to contact Support about a specific Job, please take note of this Job ID. Sometimes you may find that Jobs are also divided by segments (specially when customers use TM). Inside of the Job white square box, you can see that segments are separated by a horizontal line. Once you start typing your translation in one of the segments, you will notice that the rest of the segments get a red error warning that means "empty segment" and the "submit" button at the top turns red and says "fix errors to submit". This is normal, so please don't worry about it. Once you complete all the segments, the error warning will disappear and the "submit" button will turn green again. In order to submit your translations, you will need to complete ALL the Jobs of a Collection, and ALL the segments of each individual Job. Communicate with the customer and other translators by clicking on the comment icon located to the left of the job window. Please remember to always be courteous and professional when communicating with customers, and never share your contact details. Please remember to always be courteous and professional when communicating with customers, and never share your contact details. Triple brackets around text are inserted by customers to markup words that [[[should not be translated]]]. Customers can request that their translations are no longer than a certain number of characters (e.g. 140 characters for a tweet). Customers can provide a glossary of terms that they would like to be translated in a specific way (e.g. product names). For more detailed instructions on how to use the glossary feature, please read this article. 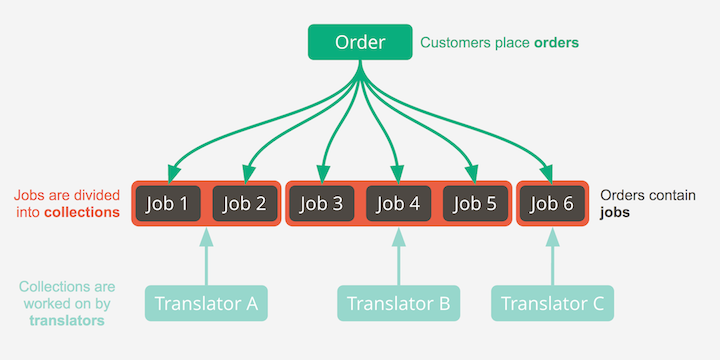 Translation Memory (TM) is a database that automatically stores and matches segments (based on sentence structure) that have previously been translated, and reuses them to aid translation. The different types of matches can be found by opening the matches panel (click on the lightbulb icon), and are based on how closely the stored text matches the source text. Click on fuzzy matches to insert them into the target text. Exact and contextual matches will be pre-inserted into the target before the collection is started. All matches should be checked and edited before submitting. Learn more about how TM works. Filter Jobs by "Cautions and Errors"
You can submit your Jobs once all errors have been resolved. When you have completed all the Jobs in a Collection, you will be able to submit them to the customer. Can't complete all the jobs in a Collection because a single job is in the wrong source language? See what to do here! Keep in mind that, when you hit submit, all Jobs in the Collection will be submitted (even if some are incomplete!). This includes TM matches and the partial translations that you or a previous translator may have left there. You should avoid in all cases submitting incomplete or incorrect translations, as these reach directly the customer and you won't be able to edit them. So, before you submit your translations, please make sure you have already completed them all and reviewed them carefully. Once you are sure of this, just click the green "Submit" button at the top right. Before you finally submit the Jobs, you will see a confirmation pop-up window. After the Collection has been submitted, you will be returned to the Dashboard. If for some reason you cannot complete all Jobs in a Collection before the allotted time expires, you can decline it by selecting “Decline Collection” from the “Submit” button. You will be paid the reward amount shown in the Collection information. When the Jobs are approved, the rewards are added automatically to your account balance, and you can request a Payout twice a month. If you do not complete and submit all Jobs in a Collection, you will not be paid. What happens if my Collection expires? If you don’t meet the deadline, all the Jobs will become available for other translators to complete. What should I do if I have a disagreement with a customer? What should I do I do if I encounter a technical issue? How do I edit a translation I've submitted? After you submit it, you won't be able to edit your translation. If you have submitted your translation and find that you missed a small error (even after careful review), please contact support and we'll do our best to help you.